I’m not big on most cupcakes, with their dry cake and shortening-laden icing. Sometimes, however, they can be surprisingly delicious, and they are at their most scrumptious when they are filled with a lusciously hidden flavor bomb. In this case, fudgy dark chocolate cake is strategically injected with silky milk caramel and topped with a thin layer of fudge. Nothing dry or shortening-laden here. 2. 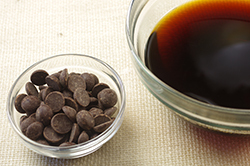 In a medium bowl, mix the chocolate into the hot coffee and allow to melt. Set aside. 3. 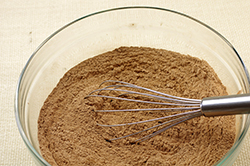 In a large bowl, whisk together the flour, cocoa powder, baking soda, baking powder, and salt. Set aside. 4. 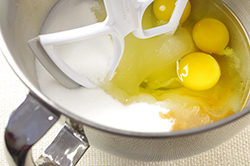 In the bowl of a stand mixer fitted with the paddle attachment, beat the sugar, eggs, oil, and vanilla until fluffy. Pour the buttermilk into the chocolate mixture and stir. 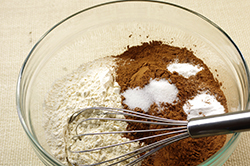 With the mixer on low speed, slowly add one-third of the chocolate mixture, followed by one-third of the flour mixture. 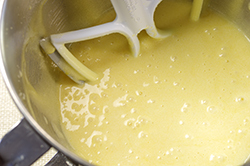 Continue alternating between the two until both mixtures are incorporated into the batter. 5. 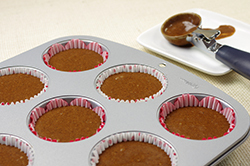 Line 24 muffin-tin cups with muffin papers of your choice. 6. Using a large cookie scoop, add one scoop of batter to each muffin paper, filling each about three-quarters full. Bake for 20 minutes, or until a toothpick inserted in the middle of the cake comes out clean. Remove the cakes from the tins and allow to cool completely on racks. 1. Once the cupcakes have cooled, poke a hole halfway into the center of each cupcake with your index finger. 2. Fill a pastry bag fitted with a large open tip with dulce de leche. 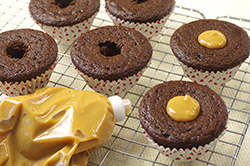 Insert the tip into each cupcake hole and squeeze the caramel into the cupcake until you see the cupcake expand a bit. 3. Roll a golf ball-size portion of cooled fudge frosting in your hand and flatten it into a neat circle approximately the size of a cupcake top. 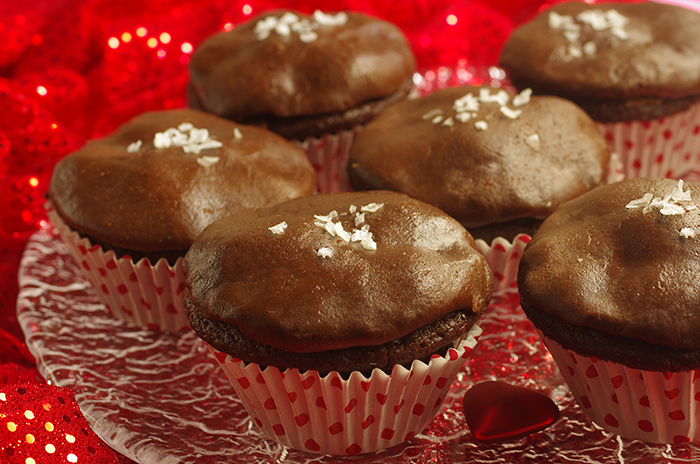 Place the fudge disk on top of a cupcake and sprinkle with sea salt. Repeat with remaining cupcakes. 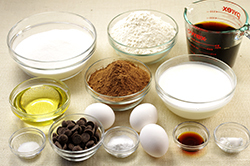 Makes enough to frost 1 (10-inch/25-cm) round cake or 8 large cupcakes. This is a spreadable frosting when it gets to exactly the right temperature and consistency. Unfortunately, I tend to forget the frosting altogether while I’m running around the kitchen, and there’s a definite point beyond which the frosting just doesn’t want to be spread. But I’m not one to let a perfectly good fudge frosting go to waste. What I like to do is take a heaping spoonful of the frosting, roll it in a ball in my hands and then flatten it just enough to cover the top of a cupcake. Manhandling the frosting brings on a nice sheen, and by rolling and flattening as symmetrically as you can, you’ll have a very clean (and delicious) topping for your latest cupcake invention. Personally, I top my chocolate dulce de leche cupcakes with this shiny marvel. 1. 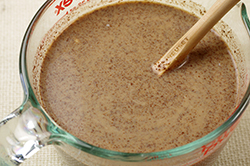 Place all the ingredients except the vanilla paste in a heavy saucepan over low heat, stirring until the sugar has completely melted. 2. Clip on a candy thermometer, stop stirring, and heat to 234°F (112°C). 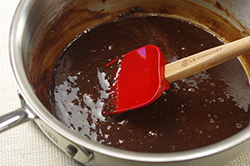 Remove the pan from the heat and allow the frosting to cool slightly. 3. 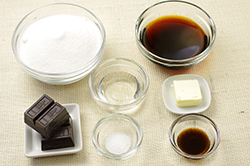 Add the vanilla paste and beat with a wooden spoon until the frosting thickens enough to spread on a cake. 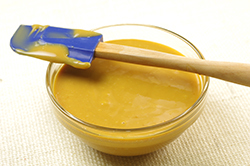 If the frosting becomes too thick, add 1 tablespoon (15 ml) of cream and stir. 1. 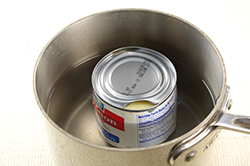 With a can opener, puncture two holes into a can of condensed milk, but do not take off the entire lid. You want air to flow freely so that the can doesn’t explode during cooking but you still want to take advantage of a secure lid to keep water from penetrating the caramel. 2. Place the can in a deep sauce pan and fill the saucepan with enough water that it reaches three-quarters of the way up the side of the can. 3. Heat over medium-high heat until the water comes to a simmer. 4. 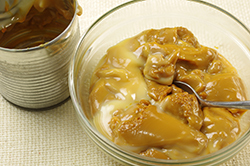 For a pourable dulce de leche, cook for 2 hours. 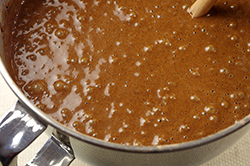 For a more firm dulce de leche, cook for at least 4 hours. Keep an eye on the water levels at all times, adding water about every half hour to insure that the can is submerged three-quarters of the way.